As mentioned before, the new version of this mod corrupts your save right after the Illusive man scene. I don't know why the hell it isn't mentioned on the mod page but DO NOT DOWNLOAD THIS MOD. 40 ours of gameplay?Wasnt ME3 around 100 or more with mods? Maybe that's the point.. I think, that he ignored most of the side missions and haven't got enough War Assets to have good ending..
One day if I'm disgustingly rich, I'll buy up the Mass Effect IP, make a remaster, and errata the ending as a whole! Until then, this is better than the original. Thanks for making this. That was... weird. Had a douche chill when that ship goes "you're going after shepard?". I'll take the original ending. But thanks for making this anyway. So, I adore this mod. Really, I do. It makes my heart happy. BUT. Since a lot updated their huge mod, it now breaks BioD_End002_500Choice.pcc as mentioned downthread. This causes the game to freeze at the conclusion of the Illusive Man scene and the autosave corrupts so you have to start back on Earth and go through everything to have it freeze again. Replacing the corrupted file with a backup pre-a lot works if you have it, to get past that scene. BUT. That is changing a DLC after texture mods, so unsurprisingly, that means when the memorial scene triggers, and in all scenes and save files/characters thereafter across ME3, Shepherd and many other characters have black polygons on some or all of their faces, black screens replace actual screens, white lights appear on faces, a giant shadow moves around with you, etc. It makes the game nigh on unplayable afterwards. I had to reinstall the game and rename/repair the ini file to get any saves to work without the black polygons and shadows. I really hope a patch comes soon for MEHEM or a lot to fix that so we can all be happy with the ending again. Semi-related note, Miranda Redone is incompatible with this mod, as it causes a voiceover, a dialogue wheel appearance, and then a critical failure/game over crash every time the memorial scene triggers. The mod maker knows and has stated there are no plans to patch for this so just, FYI. So the first time I played with this mod, everything worked just fine, but on this playthrough I started having the black screen issues. Restarting the game got me through the first one (after the rescue team finds Shepard), but then I got another after the scene of the Normandy outrunning the Crucible blast. I tried the fix outlined in the FAQ (since I had modified the files because of the crashing issue related to a lot), but no luck. I will say this is my first playthrough with both MEHEM and Citadel Epilogue installed. Could that be causing some kind of issue? So WTH has this mod doing this all of a sudden? a lot updating??? Project Variety??? Cause they're the only 2 mods, out of the others I have installed that have recently updated. Prior to that, my game always worked. I hope this gets resolved QUICK...I can't progress past the ending now to start playing my Citadel DLC!!! Just encountered this exact same issue (after fixing the issue with a freeze after the IM's death aboard the Citadel). Can confirm just reinstalling the mod does the charm. A couple more notes on some bugs I encountered in the last few moments of the game. It's been a couple years since I last did a playthrough of the trilogy but I didn't encounter this problem with MEHEM last time. The memorial wall is glitched. I couldn't see Anderson's name on the plaque nor anyone else's name on the wall. Most of the wall was black as was Anderson's plaque. Additionally, those red circles on characters indicating possible interaction were on most everyone during the memorial cutscene. This may be a dumb question but how do i know if this mod is working? I just installed the mod after saving a new game on mars. Charge the beam....If you hear Harbinger speak to you, it's working. This is a mod that effects the ending...so you're going to have to play up to the racing to the beam again to tell. 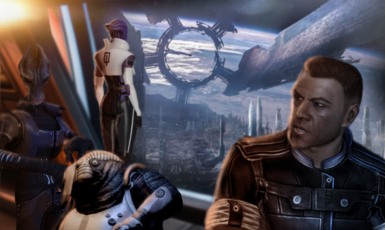 Is this mod compatible with the a lot texture/graphical mod for ME3? Yes, just install it before you install ALOT. Is it a good idea to play the normal endings first then this one to compare? 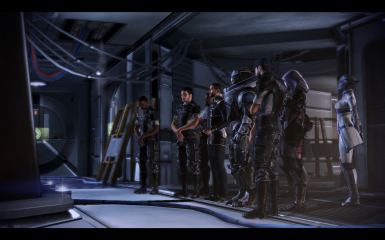 Yes, it's the best idea if this is the first time you play Mass Effect 3. It's what I personally did. This should've been the cannon ending. 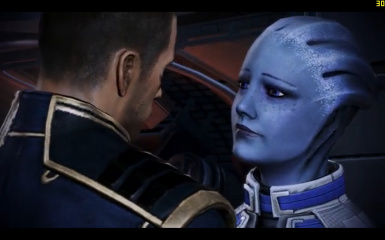 This is everything that I wanted in a Mass Effect ending. Finally some closure. Thank you for giving this to us. Yeah some of the voice acting isn't great, but other than that it's perfect. I literally cried! This made me so happy. As for the negative comments, I guess it's not right for everyone but I think it'll be perfect for most people. If you too were disappointing by the original ending, you *must* give this one a try. By the way, I restarted the mission Citadel: The Return (the last mission) and the mod still works in case anyone wonders. If the game crashes to you after The Illusive Man dies, it's probably because of compatibility issues with other mods. Once you fix this, click on load and you'll see that the mod actually created an auto save for you so you don't even have to restart the whole mission again! It's great. I'm very grateful for this. I can't even imagine how much time and work this took.